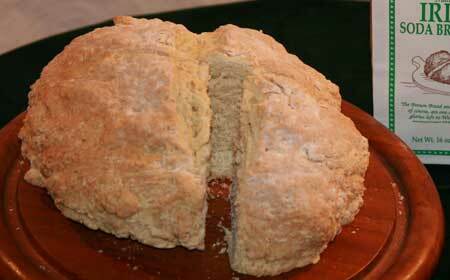 “The Brown Bread and White Soda Bread, of course, are one of the few natural glories left to Western civilization” – from Richard O’Conner’s “The Irish, Portrait of a People”. Garvey’s award winning Irish Soda Bread is the mix that started it all; inspired by sell out classes at Frederick and Nelson's Arcade Cooking School. This delicious and nutritious bread is sugar and yeast free and has no trans fat, nor preservatives. All you need to add is buttermilk to enjoy this hearty bread. Empty mix into a bowl and with a wooden spoon, or by hand, stir in enough buttermilk to make a soft dough – it should feel like your ear lobe. Bake 30 – 35 minutes. Breads will have a pleasing color when done, and bottoms, when tapped, will sound hollow. Cool on wire rack, or serve hot – wait at least 15 minutes before cutting.